A couple of years ago extensive measurements have taken place to map the performance of several M5 types. 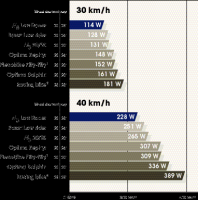 In the graphics is shown what speed is reached at a power input of 250 Watt. The measurements were taken on a smooth road surface, no wind, no inclination. In 1999 measurements were taken on sevaral brands and types of recumbents. The results of these SRM-measurements are shown in the summary alongside. Measurements done by Bert Hoge on March 29 1999 in the Velodrome in Amsterdam. The used M5 Low Racer was equipped as a standard rental bike (with "real" aero-rims, no "compromise" Rigida-rims). A power of 250 Watt can be maintained by a trained cyclist of normal posture for minimal one hour. As you can see; climbing with a recumbent or an upright doesn't matter if the total weight is the same. Measurement taken by the Dutch Recumbent Club NVHPV. In this scheme the increase in speed is shown in relation to a conventional racing bike. In this report the amount of effort needs to be delivered to reach the same speed as a conventional racing bike. 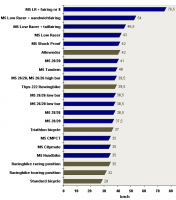 On top is the M5 Low Racer which needs 72 percent less power input than a racing bike!